I’ve thought about Divine Love and human needs a lot since leaving Christian Science. Other religions openly embrace modern medicine and technological advances as God empowering man with the ability to heal, while Christian Scientists seem to view this knowledge as the forbidden fruit and the very acknowledgement of it dooms them to a mortal life outside the Garden of Eden. It reminds me of the story about the man who drowned, when he finally meets God, God is unsympathetic, and reminds the man that “two boats and a helicopter” had been sent. Clearly the man was not a devout Christian Scientist, then he would have prayed to know the encroaching water wasn’t real and couldn’t do any harm, the water would have magically parted and the man – and his property – would have been spared. God loves the Devout Christian Scientist, God thinks his neighbors are assholes (sort of like Noah and the flood). I’m pretty sure that’s NOT HOW IT WORKS, but I digress. Let us continue with the intentionally-turned-down-opportunities theme and say the Christian Scientist dies of measles. The Christian Scientist meets God, and reminds God that they prayed and had faith, and knew that God Loved Them No Matter What. God says, why didn’t you get vaccinated or seek medical assistance? I’ve given humans thousands of years of medical knowledge to work with, why turn your back on it? The Christian Scientist attempts to argue that they are Spiritual, not material. 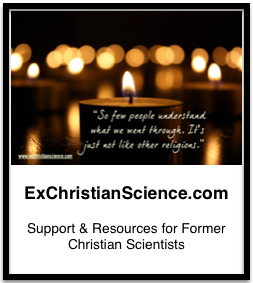 God reminds they Christian Scientist that now they are with God now, and that’s about as immaterial (1) as they can get. not nominal worshippers. They have set out to preclude the Adam dream by refusing to take the medical route. They have surrendered all, trusting divine Truth to break the dream. They are God’s merchandise, and will not be tinkered with by any other method. They refuse to be called just a lot of sick folk, but they are a peculiar people. These are among those who have had more than one proof of God’s care, and are waiting for the next one here and now. How are these attitudes loving? For a religion which claims to emanate (2) Divine Love it treats those who are wrestling with “the Adam dream” (or whatever the problem is) in the most unloving and judgmental of ways. Today’s CS seem to come with the attitude that CS is somehow superior to modern medicine, and that they have no need to avail themselves of material aid – often at their peril. While other schools of religion embrace the idea that God has given us the knowledge and technology to intervene and cure diseases, CS continues to happily deny that disease is real at all. A compromise is in order, until CS start to heal and ascend – JUST LIKE JESUS DID, responsible medical practices should be encouraged. Yes, offer the weary seeker a cup of cold water in Christ’s name, but then offer them whatever medical aid they may need as well. Yes, Jesus preformed miraculous feats of healing, but unless you’re managing the same instantaneous results find a licensed and responsible healthcare provider. Is it really the most loving thing to do to tell a child who has just had their wisdom teeth extracted they “don’t need anything” for the pain? Or to allow someone to suffer vivid fever hallucinations instead of attempting to bring it under control? Is it loving to allow your child’s whooping cough go untreated for days? Or allow those who are on death’s door to writhe in agony (3)? OF COURSE NOT. If Christian Science wants to survive and thrive they need to stop denying the reality in which they are living – while they may be Spiritual Ideas of God, they also need to tend to their material selves if they want to stay in this existence for any length of time. While positive thinking and proper attention to hygiene (regardless of what Ms. Eddy says) will get you far, having a well stocked medicine cabinet, some practical knowledge of first-aid and a good primary care physician are important too. If God really loves us so much why simultaneously endow humankind with tremendous medical knowledge and a religion which encourages it’s adherents not to use it. If this is another case of the fruit of the tree of the knowledge good and evil than the God in question is a sadist and not to be trusted (or worshiped), or perhaps Christian Science is wrong. Both is also a possibility. Withholding pain medication from the dying is cruel. Withholding pain medication from people who have just had surgery is cruel too.